A Werewolf Named Oliver James (Arthur Levine Books) follows Oliver on his first night as a werewolf. It’s just the right mix of fun and scary for elementary grades! 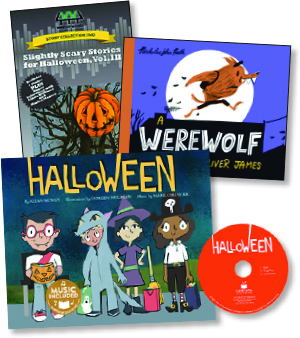 Halloween (Cantata Learning) (book and CD) features cool ghouls, only-slightly-spooky zombies, and lots of treats. The CD has a reading of the story, a musical version, and a sing-along instrumental version. Slightly Scary Stories for Halloween, Volume III (Weston Woods) (DVD) includes video versions of three favorite Halloween tales—The Little Old Lady Who Was Not Afraid of Anything, A Very Brave Witch, and Los Gatos Black on Halloween. Very fun! How can you win? Submit a comment to this blog to share your favorite book to read at this time of year. Send your comment by Tuesday, November 13. One lucky teacher will be randomly selected to win this week’s prizes. Have you signed up for Epic! For Educators? 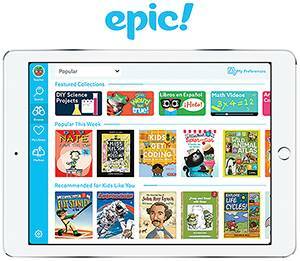 You’ll get access to 25,000 books and educational videos for free at getepic.com/educators. Find award-winning fiction, biographies, animal books, STEM titles, and more. Students get personalized profiles with reading recommendations. Click here to sign up. 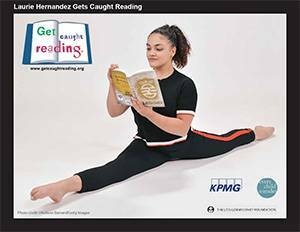 Olympic gold medalist Laurie Hernandez is ready to encourage your students to read, read, read. Teachers and librarians can sign up to get 10 free posters featuring Hernandez and available at Get Caught Reading. Hernandez has a new children’s book just out, She’s Got This, which is about chasing your dreams. Grab free interactive writing lessons that are proven to boost student motivation, develop a growth mindset, and inspire student writing. 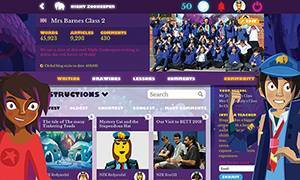 Visit nightzookeeper.com/teachers. The lessons are for grades K–8. Can’t wait to conjure up more freebies, grants, and giveaways for you next week! PS: Here’s the most popular Halloween joke at my house: How do you fix a broken jack o’lantern? With a pumpkin patch! I love to read “Room on the broom”. I really get into it and the kids love it. The Teeny Tiny Woman by Paul Galdone …. I can always ‘get them’ at the end with the BOO! I love The Little Old Lady Who Was Not Afraid of Anything and Arthur’s Halloween. Pretty much any of the Goosebump Books. Kids love them. Click, Clack, Boo is a favorite in my classroom but you really cannot go wrong with almost any Halloween or pumpkin book. The kids always love them! Stellaluna by Janell Cannon is my favorite book to read around Halloween time. The kids see a bat as having a connection to Halloween. Along with reading the book, we have integrated thematic instruction with all subjects about bats. This topic is important, because bats are endangered and are also very important to our environment. They also catch the attention of the students, because they are cute. So, the kids want to learn more about them and are willing to read, write, and do math while working in pairs, small groups, and whole class activities that use the bat theme. And, at times I have been known to slip in some fun activities with a Batman theme during our bat thematic unit as well. I traditionally read “The little Old Lady Who Wasn’t Afraid of Anything,” but this year I have a new favorite; “Bear Feels Scared,” by Karma Wilson. These are great suggestions, keep ’em coming! I do adore Junie B.!!! My favorite book to read at this time of year is The Little Old Lady Who was Not Afraid of Anything. Mt students love participating in the movements and they all are startled when the pumpkin head says Boo! It would be a toss up between Velcome and The Little Old Lady Who Was Not Afraid of Anything. OH goodness, gotta love good old Arthur’s Halloween by Marc Brown. I always love their adventure and D. W.!